His confession is an obvious break from a stale Puerto Rican stereotype that claims we all love pork. As a Puerto Rican who doesn’t eat much pork myself, Pérez’s views on “the swine” (as he calls it) don’t surprise me. But because people are defined just as much by choices they abstain from as they are by what they choose to enjoy, I ask him about it. “But Puerto Ricans love pork,” I say. Pérez in his kitchen in his home kitchen in the Austin neighborhood. He is showing me all that goes into one of his cooking classes and meals (Justin Agrelo/Medill). And it is this idea—that Puerto Rican cooking is much more than its traditional dishes, much more than typical recipes, much more than contemporary imaginations have allowed it to be—that guides Pérez’s work. Pérez, 44, is the founder of Urban Pilón, a culinary business that offers catering, private dinners, and cooking classes. 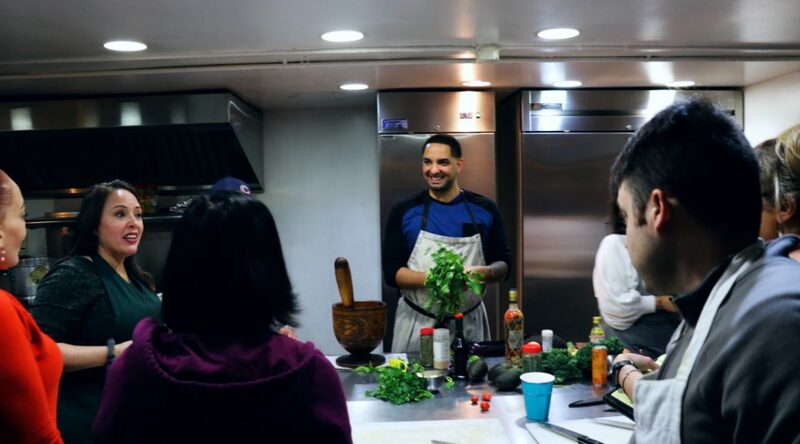 The main goals of his classes are to teach people how to make Puerto Rican food with fresher, more natural ingredients while also expanding their ideas about what Puerto Rican food can be. Pérez sees Urban Pilón as a vehicle to help revitalize Chicago’s Puerto Rican food scene–a scene he sees as stuck in the past. One look at his Instagram and you’ll see his vision put into practice. It’s full of dishes you won’t find at any Puerto Rican restaurant in town. Dishes like shrimp in creole sauce on cassava dumplings or taro root bread pudding with coconut. He recently hosted a dinner with a menu made entirely of Puerto Rican dishes from the 19th century. These fried plantains will be used to make monfongo, a traditional Puerto Rican dish. Perez mixes them with boiled yuca to add texture and an update to the dish (Justin Agrelo/Medill). Urban Pilón is the amalgamation of several food-related experiences that were happening in his life all around the same time. 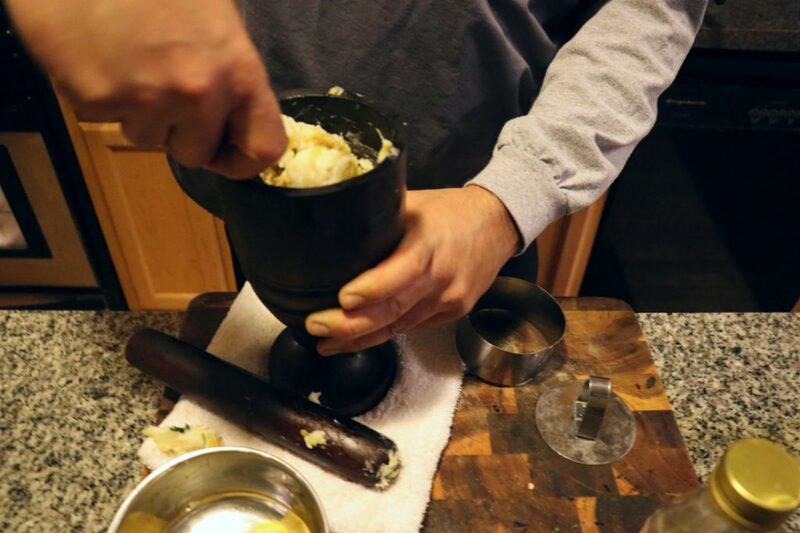 Pérez mixes fried plantains and boiled yuca using the pilón–a pestle and mortar–as he makes one of his signature mofongos (Justin Agrelo/Medill). Reading food labels quickly became a habit. 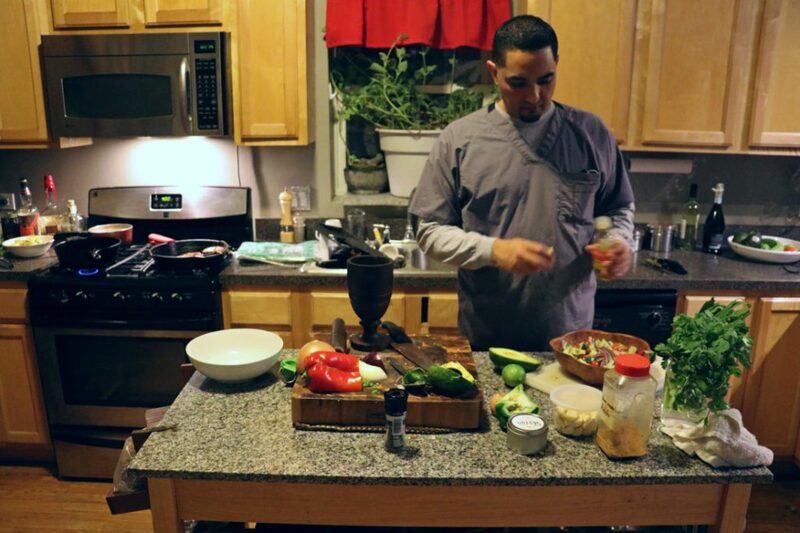 He soon realized many of the iconic, commercial seasonings such as sazón and adodo that he and other Latinx people grew up eating are stuffed with artificial ingredients and additives. Pérez also realized that he liked cooking — a lot. It slowly grew from a chore life had forced on him into a full-blown passion. He began reading cookbooks, following food blogs, researching chefs and studying their techniques, watching YouTube videos, pulling wisdom from older people in his life, and traveling around the Caribbean and Latin America in search of inspiration. 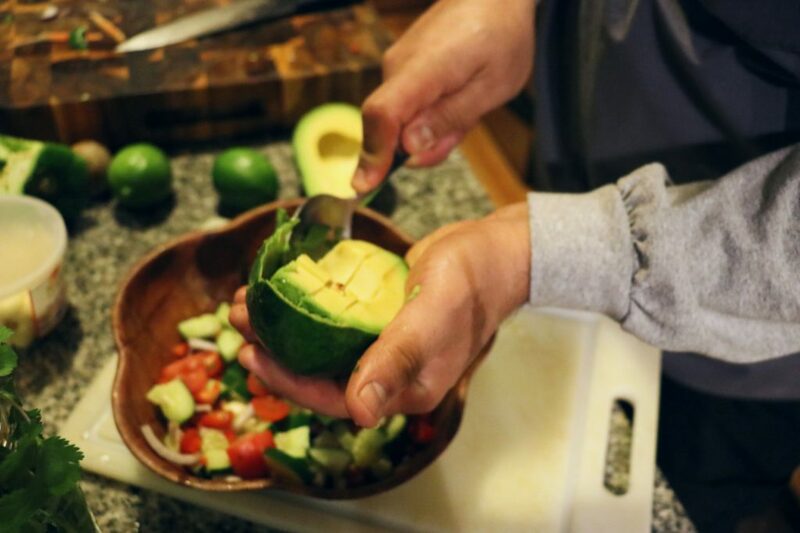 Pérez scoops out the insides of a Caribbean avocado and adds it to a side salad (Justin Agrelo/Medill). Around this time Pérez was also searching for the best mofongo in Chicago, but couldn’t find a restaurant that served one he thought was good enough. After surveying several Puerto Rican restaurants in town, Pérez began to feel as though he was reading the same menu over and over again. He began to get frustrated. Not only by his inability to find an amazing mofongo, but also by what he saw as a lack of innovation and creativity within Chicago’s Puerto Rican restaurants. The dish Pérez and I make at his house. It’s sea bass topped with a creole sauce, stuffed with grilled shrimp, and a side of mofongo de yuca, all on a banana leaf and an edible flower (Justin Agrelo/Medill). Pérez says he feels a lot of these restaurants are “stuck in the 80s.” That their menus haven’t seemed to have changed much over time and many of them serve the same traditional Puerto Rican dishes. Perez travels to Puerto Rico often to visit his mom who lives in Ponce or to perform with his band, Bomba con Buya. He says the restaurants in Puerto Rico are much more innovative and creative than the Puerto Rican restaurants in Chicago. “If you had the chance to eat in Puerto Rico, then you realize that things are going good,” he says. “But I don’t think that for Chicago. Maybe it’s because we’re in the diaspora. Maybe it’s the distance. But I don’t think [Puerto Rican food in Chicago has] evolved” the way it has in Puerto Rico. Puerto Rican food historian Cruz Miguel Ortíz-Cuadra is the author of the book Eating Puerto Rico, which chronicles the history of food and eating habits of Puerto Ricans. Ortíz-Cuadra agrees that being in the diaspora has had a real impact on Puerto Rican food in Chicago. He says the menus in Chicago’s Puerto Rican restaurants seem like they haven’t changed much over time because of the interconnected relationship between food and identity. Pérez searching through the cabinets in his kitchen. 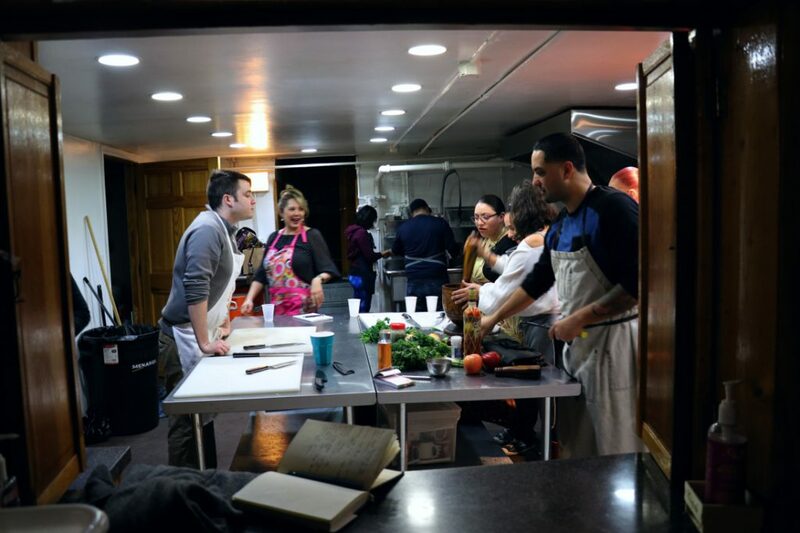 When Urban Pilón first started, Pérez used to host cooking classes out of this kitchen (Justin Agrelo/Medill). Ortíz-Cuadra says many Puerto Ricans who are born and raised in the U.S. may experience a loss of Puerto Rican national identity. Cooking the same, iconic dishes becomes a tool for Puerto Ricans in the U.S. mainland to claim and assert their ethnic identity in a country where they constantly have to negotiate if they are Puerto Rican or not. Memory and nostalgia also play an important role in these conventional menus, according to Ortíz-Cuadra. Puerto Ricans in Chicago want to eat foods they grew up with but may not always want to (or even know how to) cook these foods themselves. These restaurants provide a space to satisfy that longing. In many ways, these iconic Puerto Rican dishes are symbols of resilience and cultural preservation—foods that have withstood the forces of migration and assimilation in an erasure-prone-city like Chicago. Pérez is a great example of Puerto Rican creativity always moving forward. When we arrive at Rico Fresh, he heads straight for the produce. He holds up two bright bell peppers–one red and one green. He says we’re going to make a deconstructed sofrito tonight (a sauce that is the base of many Puerto Rican dishes). Sofrito is typically made with only green bell peppers, but Perez says he doesn’t like his sofrito “just green,” A small example of how adhering to the traditional rules of Puerto Rican cooking doesn’t interest him. 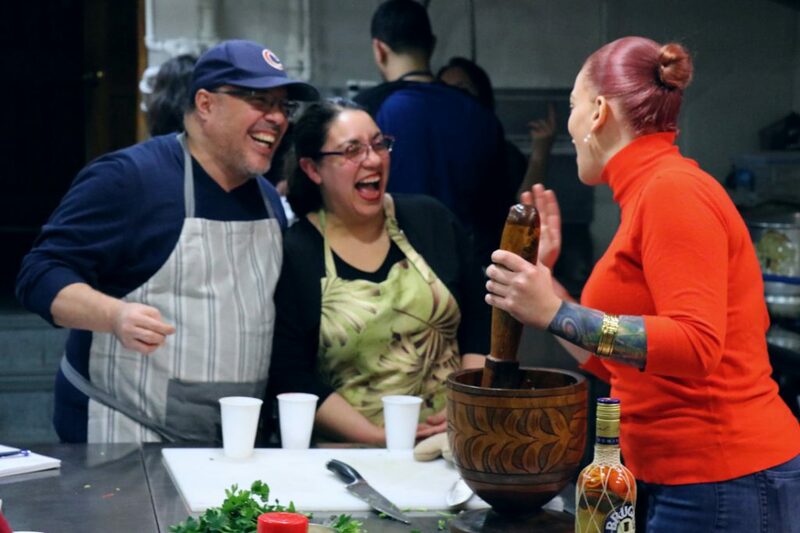 Pérez teaching his adult cooking class in the kitchen of San Lucas Church in Humboldt Park. He is wearing a dark pea coat and dark pants. There’s a familiarity in the way Pérez speaks—the way he uses “man” at the end of a statement to emphasize a point. His demeanor is calm and careful even when he’s being critical. He pauses in the middle of his sentences and seems to be choosing his words wisely. But it’s not in a way that makes you feel like he’s afraid of candor or saying something politically incorrect. It’s almost as if he wants his words to land gently—free of discomfort, awkwardness, and pain. A habit he likely picked up from his time as a teacher. Since starting Urban Pilón, Pérez has been teaching cooking classes to both adults and kids throughout the year. I get to see Pérez “the teacher” twice. The first time is after we leave Rico Fresh. We head back to his house and enter through a side door that opens into a large dining room. During the early days of Urban Pilón, Perez used to host his classes in his home. Now, they’re held in the basement of San Lucas Church in Humboldt Park. When we enter his house, we’re greeted by his energetic puppy, Layla, a two-year-old boxer who won’t stop jumping on me no matter how much we both plead with her. The shelf of pilóns in Perez’s kitchen. Some were gifts from friends and others her purchased himself. There’s a mural on the wall opposite the entrance that says “cocinando suave,” painted in large orange and red bubble letters. Above the mural is a shelf full of wooden pilóns (mortars and pestles)—a symbol in Perez’s cooking and brand. He knows the origin of each pilón by heart. Reading them from left to right, he lists which country each one is from and the person who gifted it to him. Haiti, the Dominican Republic, India, Mozambique, Kenya, Zimbabwe, San Thomas, Mexico, and Ghana are some of the countries represented on the shelf. Not long after we step inside, Pérez throws on a cooking shirt and we get to work. He stops to teach me a technique on how to cut open plantains without a struggle (the trick is to cut along the ridges and then set them under running, warm water for about 7 minutes). Cooking with Pérez is part cooking class, part history lesson. He tells me about the first documentation of mofongo, the importance of yuca to the Tainos, how to make my own adobe free of harmful additives, how it’s only foods people of color eat that get an “unhealthy” label. I drop into one of his classes the following Thursday. He’s standing in front of the class sharing some of history with a group of students. He tells them an anecdote about why Puerto Ricans call bananas “guineo” and oranges “china”–both have something to do with trade. We meet in an industrial kitchen at the bottom of the church. The class is made up of 10 students – eight women, and two men. Most of them are Latinx. The group is lively and waste no time telling jokes and opening bottles of wine and champagne. A small wireless speaker fills the room with salsa music. The class feels less like school and more like a dinner party. Perez gives the students a chance to introduce themselves to the group. In her introduction, one student, Anette Fuller, a nurse, calls Perez a “gem for our community.” She later tells me why. Anette Fuller (black shirt), is a student in Perez’s class. She helps a classmate break up some culantro leaves used to make sofrito (Justin Agrelo/ Medill). Fuller, 40, was born in Puerto Rico but grew up in Chicago. She says Pérez’s ability to both maintain and expand Puerto Rican food, while cutting out harmful ingredients is what drew her to his work. Jasmine Rivera, 31, a Chicago mom who owns and operates a photo booth company, says she heard about Urban Pilón on social media. “Everybody I know has been coming to his classes,” she says, smiling. Rivera is Puerto Rican too and, like Pérez, was born and raised in Chicago. Rivera sees her time in Pérez classes as the start of her own food journey. She hopes to open a food truck one day and wanted the space to learn how to make Puerto Rican food more naturally. Something important to her because of the health issues that run in her family. Jasmine Rivera cuts culantro leaves to help make sofrito. She says she’s taking Pérez’s class to learn how to cook Puerto Rican food more naturally (Justin Agrelo/ Medill). Pérez’s cooking students gather around a table and help prepare the night’s meal. 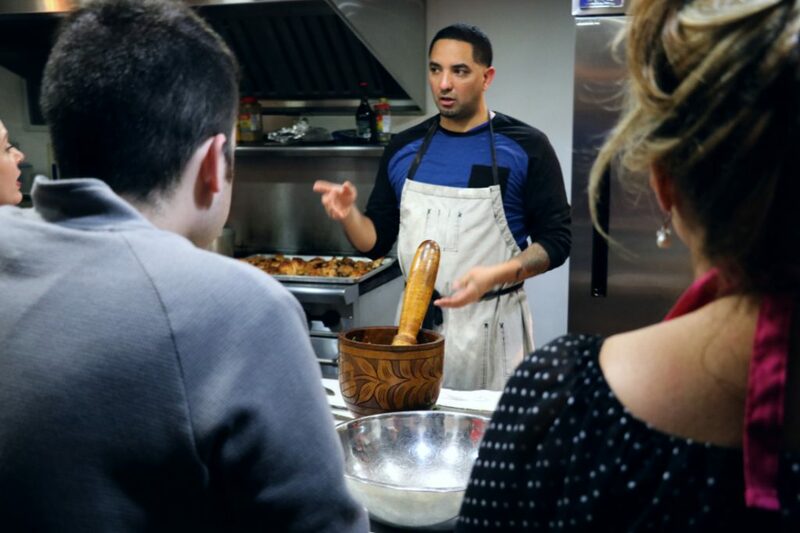 Pérez believes the lack of cooking classes that teach people how to make Puerto Rican food without relying on the same old recipes that call for processed, packaged ingredients as a serious void. A void he is trying to fill. Photo at top: Chef Roberto Pérez teaches a class in the bottom of San Lucas Church in Humboldt Park through his company Urban Pilón (Justin Agrelo/Medill).